Duck Tales: The Movie - Treasure of the Lost Lamp (Buena Vista, 1990). One Sheet (27" X 41"). Drew Struzan Artwork. Animation. Starring the voices of Alan Young, Rip Taylor, Christopher Lloyd, Russi Taylor, Richard Libertini, Terence McGovern, Joan Gerber, Chuck McCann, June Foray. Directed by Gaëtan Brizzi, Paul Brizzi, Bob Hathcock, Clive Pallant, Mathias Marcos Rodric, and Vincent Woodcock. 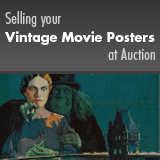 An unrestored poster that appears virtually unused. Closer inspection may reveal one or two minor flaws, such as small creases, or light edge or fold wear. A Walt Disney production. Rolled, Very Fine/Near Mint.